Ronald H. Schon was born on December 24, 1944 in Chicago, Illinois to Gunnar and Gunhild Schon. He died on October 27, 2018 surrounded by his wife and children when the Lord called him home. Ronald is survived by his wife, Lois; his children, Dawn (Peter) Nikolakakis, Keri (Cris) Burke, Kevin Schon, Kai (Olivia) Schon; his eight grandchildren, Marissa, Grace and Johnny Nikolakakis; Makayla and Riley Burke; Owen, Everett and Evangeline Schon; and his brother, Robert (LuAnn) Schon. He was preceded in death by his parents and his brothers, Roy and Ralph. 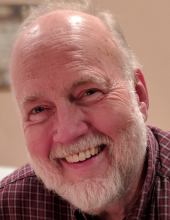 He began his career teaching drafting classes for the Chicago Public School system, worked independently as an architect and retired after 30 years from the University of Illinois-Chicago as a project manager. He was passionate about his ministry with AWANA and handing out bibles with Gideon’s international. He loved “putzing” around in the garage and staying busy with various projects, big and small around the house. He enjoyed hosting gatherings with family and friends, traveling with Lois to Hawaii, Branson, Missouri and visiting grandkids in Minnesota and Wyoming. He was a loyal Chicago sports fan, no matter the outcome. Most of all, He was a faithful follower of Jesus whose devotion to Christ never wavered. Visitation Friday, November 2, 2018 from 4:00 pm until 8:00 pm at the Glueckert Funeral Home Ltd., 1520 N. Arlington Heights Road (4 blocks south of Palatine Road), Arlington Heights, IL 60004. Visitation 10:00 am Saturday, November 3, 2018 at Orchard Evangelical Free Church, 1330 North Douglas, Arlington Heights, IL 60004 until the 11:00 am Funeral Service. Interment will be at Memory Gardens, 2525 North Arlington Heights Road, following the reception. Funeral Information may be obtained from and condolences given at www.GlueckertFuneralHome.com <http://www.GlueckertFuneralHome.com/> or (847) 253-0168. "Email Address" would like to share the life celebration of Ronald H. Schon. Click on the "link" to go to share a favorite memory or leave a condolence message for the family.